No more forums! We have developed a separate site to contain all the documentation. In this site, we maintain and update userguide for all Joomla and Magento products. All the userguide for our Magento themes & extensions are already uploaded. As for Joomla userguide, we have only updated the latest ones and will continuously update others soon. We also have a menu to link to T3 Framework documentation site. The traditional way: on Homepage, click on Support Menu > Documentation and you will be redirected to our Documentation site. Anyway you want, it’s your call! On this new separate Documentation site, we have styled in such a way that would bring you the most comfort while viewing our documents. Put right on homepage of our Documentation page, Search box has a filtering option by Category. Have your search term and now you can filter the search and quickly find what you are searching for. This feature goes along with our new site! A sticky menu is applied and now you can navigate the whole site without losing track. On each single documentation page, we apply anchor links for each section on the right sidebar. With this one, you can quickly navigate straight to the section you wish to view, instead of blindly go through all the section, with a chance of missing it. Bonus point: this sidebar is also sticky and can be moved along the content. 3. Who can access it? Our documents were not open to everyone, and you needed to be our active member in order to log into Forums and view them. However, in the new Documentation site, you will find that all the documents are all open to everyone, anyone can access and view it. Sharing is power! 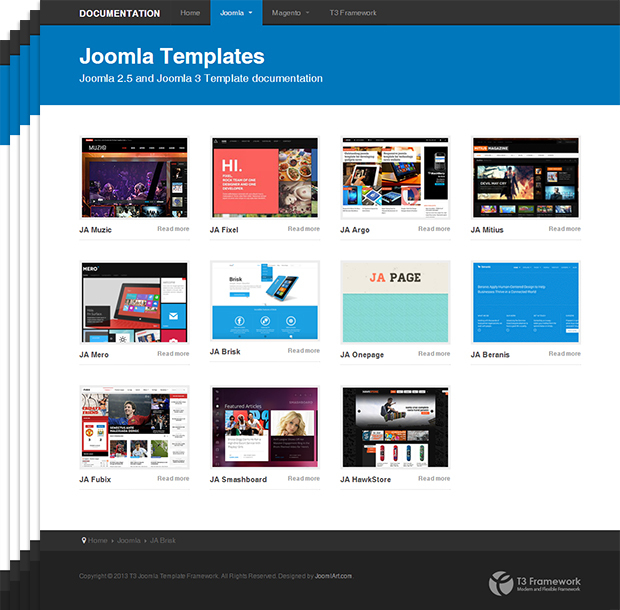 For the future plan, we will update and publish all the guides and documents for Joomla templates and extensions that are Joomla 3 & Joomla 2.5 compatible.